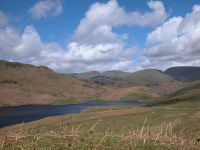 I was setting out today on a walk to the Langdale Pikes via Easedale Tarn, but the weather forecast was marginal and I was wondering if I would have to curtail or abandon it. 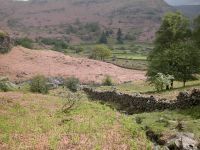 The route to Easedale runs along the Easedale road from the centre of Grasmere and then out along this track on the south side of Easedale Beck. 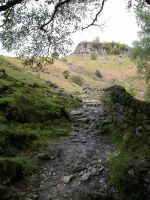 About half a mile ahead is the Sourmilk Gill waterfall. A closeup of the same scene. The point at which the path hits open country and starts to run uphill beside the waterfall. Alreadt there's a good view back down the valley. From the same spot, panning right. Cloud cover is developing. 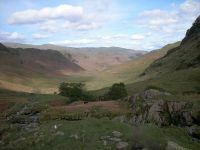 From further up the path, another retrospective view of Easedale. 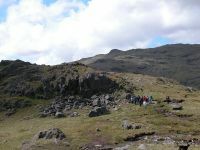 The path reaches the top of the falls and then runs for roughly half a mile before reaching the bowl of Easedale Tarn, seen here. Two hours have gone by since the last shot. 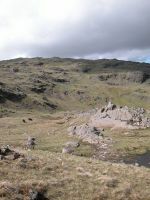 I had first followed the usual path past the tarn and across the boggy area at the west end, but the I hit the rocksteps and scrambly bits on the steep section below Belles Knott. I found it much harder going than I remembered and to make things more awkward the rain started and got ever more persistent. There came a point at which I though "why am I doing this?" and decided to go back to the hotel. 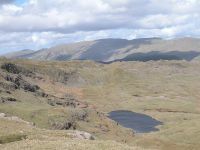 Once I reached Easedale Tarn again I was out of the rain and decided to park up on a slope overlooking the tarn, and eat my lunch. After lunch and a bit of a lazy interlude I noticed two things. Firstly, the cloud cover over the high tops was breaking up. 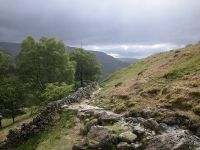 Secondly, I noticed a path which I'd never known about following a grassy rake up to Blea Rigg, to the southwest. On a whim I followed it and sailed up to the ridge, reaching it in twenty minutes. 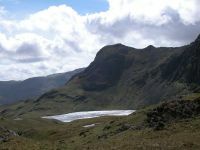 This is a shot from the path, Tarn Crag towering above Easedale Tarn. Looking eastwards along the Blee Rigg ridge towards Silver How. 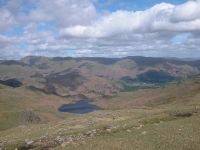 Easedale Tarn looking more distant, and Helvellyn and its neighbours seen on the skyline. 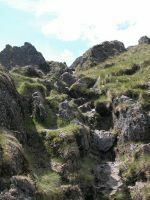 The path reaches the ridge below Blea Crag. 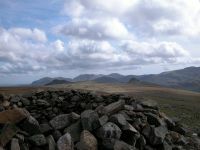 The Blea Rigg ridge has its moments, such as this, but it's much easier going than the rocky clambers at Belles Knott. Characteristic scenes on the Blea Rigg ridge. It carries any number of rocky spurs and tors and outcrops. 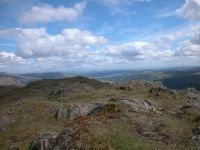 To the southwest there's a spectacular view of Harrison Stickle and Pavey Ark, rising above the unseen Stickle Tarn. And there, to the right of the previous shot, is Sergeant Man. 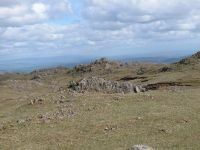 The group of walkers coming towards me had been encountered earlier during my difficulties at Belles Knott and they were surprised to see me again. 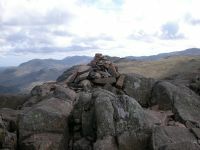 Where is the actual summit of Blea Rigg? It's rather indeterminate because the general elevation of the ridge rises to the west, but as far as I can see this particular tor is the highest. Part of Windermere appears in the view to the rear. A real change from the earlier weather conditions. It's now so clear that Ingleborough has appeared on the skyline, roughly 40 miles away. 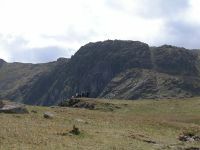 A closeup view of Pavey Ark, with its most popular ascent route, North Rake, clearly seen. Sergeant Man also looks much closer - and rather daunting. 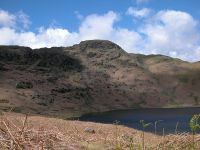 Stickle Tarn, seen from the path crossroads to the north (it's nameless but really ought to be called Stickle Hause). The route to Sergeant Man from here was surprisingly rough - steep, rocky and sloppy. Looking back down at Blea Rigg, and from here my choice of summit (the outcrop roughly on the middle of shot) seems to be confirmed. Looking slightly east of north from the same point. 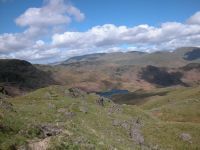 That's Codale Tarn down there, and Helvellyn and its neighbours form the skyline. 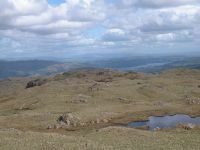 Further round to the right we see Easedale tarn again, with part of Grasmere village beyond and the Fairfield Horseshoe on the skyline. A general view of the local terrain. I wasn't convinced I was on the normal path to Sergeant Man as it was ill-defined in places and altogether rather unpleasant. 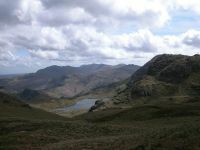 Looking back at Stickle Tarn. You can appreciate the tarn's dramatic setting from here. 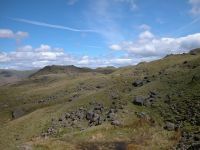 Harrison Stickle rises to the right, while the Coniston fells are seen beyond. A stomach-wrenching pull got me eventually to the summit of Sergeant Man. It was so windy here that I stayed just long enough to get this shot and then got straight off again. 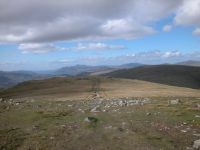 The summit tor is very rocky and I hadn't even bothered to clamber across the boulders to touch the cairn. 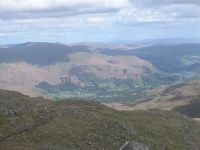 A view of Grasmere from the top of Sergeant Man. 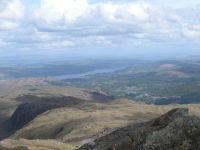 From the same point, a view of the Blea Rigg ridge with Windermere in the distance and Lonsdale far beyond. 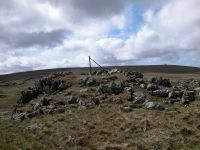 My one new "tick" of the day, the previously unvisited summit of Codale Head, a Nuttall. 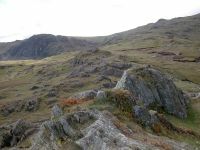 Although it stands at the head of Codale it is sufficiently far enough back from the slopes that it doesn't actually overlook it. 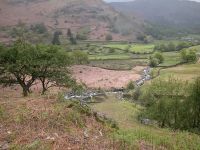 The top stands only 400 metres northeast of Sergeant Man though the intervening terrain was pathless and unpleasantly boggy. The top itself is undistinguished. Although this had been my primary objective for the day the parent fell of the group, High Raise, was visible just half a mile further on (the cairn can be seen over to the right on the skyline) so I headed for it. The walk could have been better. A simple grassy slope gets you to High Raise from Codale Head or Sergeant Man and it was such a relief to be off rock and not to have to look to every footstep, but the wind was mind-numbing and the recent rains had saturated the ground. I almost fell into the wind shelter on the summit of High Raise and rewarded myself with two cups of tea. 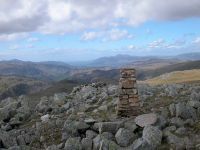 High Raise, 2500ft, the highest summit of the Central Fells and the parent fell of the Langdale Pikes. 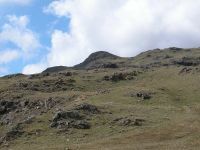 The fell is so broad and flat-topped that it's more typical of the Pennines than the Lake District. There is no foreground interest but the distant panorama is superb. 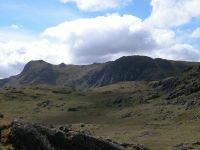 High Raise stands more or less in the middle of the Lake District and there is a full 360-degree mountain panorama. In this shot we're looking north, with Skiddaw on the skyline and part of Keswick in view. The dip to the left is Langstrath. 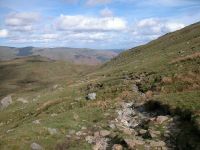 I didn't want to go back the same way and I certainly didn't want to tackle the Belles Knott scramble again, so I chose Far Easedale as an alternative descent. 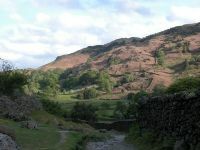 It's the route of the Coast to Coast Walk and I reckoned it should provide a swift and hazard-free return to Grasmere. 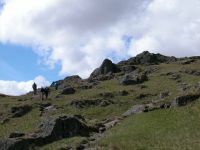 The route goes north off High Raise to Low White Stones (pictured) and then down a steeper slope to the Greenup col. The route down to the col proved to be so wet and slippery that I lost my footing and got plastered in mud. I was not pleased. Some time later. I wished I hadn't come this way. 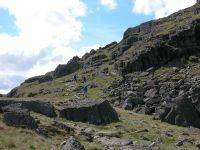 The path from Greenup Edge initially crosses the mossy wastes at the head of the Wythburn valley, which is the only major Lakeland valley not to carry a walkers' path. I found out why. Considering this is the route of the Coast-to-Coast it's in an awful state - it's ill-defined and peters out at several points, leaving the walker floundering across mosses, bogs and innumerate watercourses. 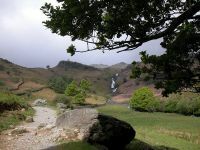 It's only once you get to the minor col at the head of Far Easedale that things improve. The path was still rough and what you see here was the best going I'd found in a good 45 minutes. 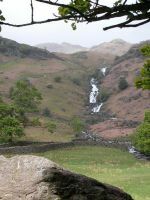 A mile of easier going takes you down to Brimmer Head farm and then Lancrigg, the first habitation on the outskirts of Grasmere. It was about 6.45pm by now. The sun lights up the slopes of Silver How opposite. 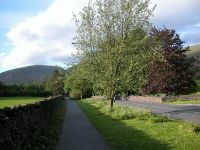 I was back in the centre of Grasmere at 7.05 (sadly the village shop had closed) and not much over ten minutes later I was back in the hotel room. This was the final shot of the day, just before I crossed the man road over to Forest Side.